Nepal experienced a struggle for democracy at times in the 20th century and early 21st century. During the 1990s and until 2008, the country was in a civil strife. A peace treaty was signed in 2006 and elections were held in the same year. In a historical vote for the election of the constituent assembly, Nepalese parliament voted to oust the monarchy in June 2006. Nepal became a federal republic and was formally renamed the 'Federal Democratic Republic of Nepal' ending the 200 year old Shah dynasty. In a Licchavi-era inscription found in Tistung, the local people have been addressed are the 'Nepals'. Experts are of the opinion that some or all of the inhabitants of Nepal in the ancient period were likely called 'Nepals', which meant that the word 'Nepal' was used to refer to both the land and its population. These Nepals are considered the progenitors of modern-day Newars. The terms 'Nepal' and 'Newar' are variations of the same term. Other variants found in medieval texts are 'Nepar' and 'Newal'. Nep are the people that used to be cow herders (gopal) who came to the Nepal valley from the Ganges Plain of modern-day India. Combining the two words yields Nepal. The Sanskrit word nepalaya means "at the foot of the mountains" or "abode at the foot"; Nepal may be derived from this. The Tibetan word niyampal means "holy land". Nepal may be derived from it. Some inhabitants of northern Nepal came from Tibet, where they herded sheep and produced wool. In Tibetan, ne means "wool" and pal means "house". Thus, Nepal is "house of wool". A popular theory is that Lepcha people used the words ne ("holy") and pal ("cave") and thus Nepal to describe a "holy cave". According to Buddhist legend, the deity Manjusri drained the water from Nagadaha (a mythical lake that is believed to have filled the Kathmandu Valley). The valley became inhabitable and was ruled by Bhumigupta, a cow-herder, who took advice from a sage named "Ne". Pāla means "protector" or "taking care", so Nepal reflected the name of the sage who took care of the place, according to Nepali scholar Rishikesh Shaha. Prehistoric site of palaeolithic, Mesolithic and Neolithic have been discovered in the Siwalik hills of Dang District. The earliest inhabitants of Nepal and adjoining areas were people from the Indus Valley Civilization. The Dravidian people whose history predates the onset of the Bronze Age in the Indian subcontinent (around 3300 BC), before the coming of other ethnic groups like the Tibeto-Burmans and Indo-Aryans from across the border. Tharus, people of mixed Dravidian and Austro-Asiatic features are the forest-dwelling natives of the Cental Terai region of Nepal. The Kirat people arrived from Tibet some 2000 years ago and lived in northern Nepal. Other ethnic groups of Indo-Aryan origin later migrated to southern part of Nepal from Indo-Gangetic Plain of northern India. Also, the presence of historical sites, e.g., Valmiki ashram, indicates the presence of Sanatana (ancient) Hindu culture in parts of Nepal at that period. According to some legendary accounts in the chronicles, the successors of Nepal were the gopālavaṃśi/gopal bansa or "Cowherd family" are said to have ruled for some 491 years. They are said to have been followed by the mahaiṣapālavaṃśa or "Buffalo-herder Dynasty", established by a Rajput named Bhul Singh. The context of Kirats ruling in Nepal before Licchavi Dynasty and after Mahispal or Avir Dynasty can be found in different manuscripts. Mentioning the area between Sun Kosi and Tama Kosi as their native land, the list of Kirati kings is also given in the Gopal genealogy. By defeating the last king of Avir Dynasty Bhuwansingh in a battle, Kirati King Yalung or Yalamber had taken the regime of the valley under his control. In the Hindu mythological perspective, this event is believed to have taken place in the final phase of Dwaparyug or initial phase of Kaliyug or around the 6th century BC. We can find descriptions of 32, 28 and 29 Kirati kings according in Gopal genealogy, language-genealogy and Wright genealogy respectively. By means of the notices contained in the classics of the East and West, we are assured that Kiranti people was forth-coming in their present abode from 2000 to 2500 years back, and that their powers was great and their dominion extensive, reaching possibly at one time to the delta of the Ganges. The kings of Lichhavi dynasty (originated from Vaishali of modern Bihar of India) have been found to rule Nepal after the Kirat monarchical dynasty. The context that 'Suryavansi Kshetriyas had established new regime by defeating the Kirats' can be found in some genealogies and Puranas. It has been written in Gopal genealogy that 'then, defeating the Kirat King with the impact of Suryavanshi, Lichhavi dynasty was established in Nepal'. Likewise, It has been written in Pashupati Purana that 'the masters of Vaishali established their own regime by confiding Kiratis with sweet words and defeating them in war. Similar contexts can be also found in 'Himbatkhanda'. That purana also mention that 'the masters of Vaishali had started ruling in Nepal by defeating Kirats'. In this way, Lichhavi's regime seems to have started in Nepal subsequently after the regime of Kirats. However, different genealogies have found to be stating different names of last Kirati King. The Lichhavi monarchical dynasty was established in Nepal by defeating last Kirati King 'Khigu', according to Gopal genealogy, 'Galiz' according to language-genealogy and 'Gasti', according to Wright genealogy. In 1324 CE, Ghiyasuddin Tughlaq attacked Simroungarh and demolished the fort. The remains are still scattered all over the Simroungarh region. The king fled northwards into the then Nepal. The son of Harisingh Dev, Jagatsingh Dev married the widow princess of Bhaktapur Nayak Devi. The Thakuri Dynasty was a Rajput Dynasty. After Aramudi, who is mentioned in the Kashmirian chronicle, the Rajatarangini of Kalhana (1150 CE), many Thakuri kings ruled over parts of the country up to the middle of the 12th century CE. Raghava Deva is said to have founded a ruling dynasty in 879 CE, when the Lichhavi rule came to an end. To commemorate this important event, Raghu Deva started the 'Nepal Era' which began on 20 October, 879 CE. After Amshuvarma, who ruled from 605 CE onward; the Thakuris had lost power and they could regain it only in 869 CE. After the death of King Raghava Dev, many Thakuri kings ruled Southern Nepal up to the middle of the 12th century CE. During that period, Gunakama Deva was one of the famous kings. He ruled from 949 to 994 CE. During his rule, a big wooden house was built out of one single tree which was called 'Kasthamandapa', from which the name of the capital, 'Kathmandu', is derived. Gunakama Deva founded a town called Kantipur, the modern Kathmandu. It was also Gunakama Deva who started the 'Indra Jatra' festival. He repaired the temple that lies to the northern part of the temple of Pashupatinath. He introduced Krishna Jatra and Lakhe Jatra as well. He also performed Kotihoma. Bhola Deva succeeded Gunakama Deva. The next ruler was Laxmikama Deva who ruled from 1024 to 1040 CE. He built Laksmi Vihara and introduced the custom of worshipping a virgin girl as 'Kumari'. Then, Vijayakama Deva, the son of Laksmikama, became the Nepalese king. Vijaykama Deva was the last ruler of this dynasty. He introduced the worship of the "Naga" and "Vasuki". After his death, the Thakuri clan of Nuwakot occupied the throne of Nepal. Bhaskara Deva, a Thakuri from Nuwakot, succeeded Vijayakama Deva and established Nuwakot-Thakuri rule. He is said to have built Navabahal and Hemavarna Vihara. After Bhaskara Deva, four kings of this line ruled over the country. They were Bala Deva, Padma Deva, Nagarjuna Deva and Shankara Deva. Shankara Deva (1067–1080 CE) was the most illustrious ruler of this dynasty. He established the image of 'Shantesvara Mahadeva' and 'Manohara Bhagavati'. The custom of pasting the pictures of Nagas and Vasuki on the doors of houses on the day of Nagapanchami was introduced by him. During his time, the Buddhists wreaked vengeance on the Hindu Brahmins (especially the followers of Shaivism) for the harm they had received earlier from Shankaracharya. Shankara Deva tried to pacify the Brahmins harassed by the Buddhists. Bama Deva, a descendant of Amshuvarma, defeated Shankar Deva in 1080 CE. He suppressed the Nuwakot-Thankuris with the help of nobles and restored the old Solar Dynasty rule in Nepal for the second time. Harsha Deva, the successor of Bama Deva was a weak ruler. There was no unity among the nobles and they asserted themselves in their respective spheres of influence. Taking that opportunity Nanya Deva, a Karnat dynasty king, attacked Nepal from Simraungarh. In reply Army of Nepal defended, won the battle and successfully protected Nepal from a foreign invasion. After Harsha Deva, Shivadeva the third ruled from 1099 to 1126 CE. He was a brave and powerful king. He founded the town of Kirtipur and roofed the temple of Pashupatinath with gold. He introduced twenty-five paisa coins. He also constructed wells, canals, and tanks at different places. After Sivadeva III, Mahendra Deva, Mana Deva, Narendra Deva II, Ananda Deva, Rudra Deva, Amrita Deva, Ratna Deva II, Somesvara Deva, Gunakama Deva II, Lakmikama Deva III and Vijayakama Deva II ruled Nepal in quick succession. Historians differ about the rule of several kings and their respective times. After the fall of the Thakuri dynasty, a new dynasty was founded by Arideva or Ari Malla, popularly known as the 'Malla Dynasty'. Early Malla rule started with Ari Malla in the 12th century. Over the next two centuries, his kingdom expanded widely, into much of the Indian subcontinent and western Tibet, before disintegrating into small principalities, which later became known as the Baise Rajya. Jayasthiti Malla, with whom commences the later Malla dynasty of the Kathmandu Valley, began to reign at the end of the 18th century. King Prithvi Narayan Shah captured Kathmandu at the day of Indra Jatra (festival). Malla Dynasty was the Longest ruling dynasty, ruling from the 12th century to the 18th century (about 600 years of the ruling period). This era in the Valley is eminent for the various social and economic reforms such as the 'Sanskritization' of the Valley people, new methods of land measurement and allocation, etc. In this Era, new Art and Architecture was introduced. The monuments in Kathmandu Valley which are listed by UNESCO these days were built during Malla rule. In the 14th century, before Kathmandu was divided into 3 princely states, Araniko went to China upon the request of Abhaya Malla for representing the skill of art and architecture, and he introduced Pagoda Style of architecture to China and subsequently, whole Asia. Yaksha Malla, the grandson of Jayasthiti Malla, ruled the Kathmandu Valley until almost the end of the 15th century. After his demise, the Valley was divided into three independent Valley kingdoms—Kathmandu, Bhaktapur, and Patan—in about 1484 CE. This division led the Malla rulers into internecine clashes and wars for territorial and commercial gains. Mutually debilitating wars gradually weakened them, that facilitated conquest of the Kathmandu Valley by King Prithvi Narayan Shah of Gorkha. The last Malla rulers were Jaya Prakash Malla, Teja Narasingha Malla and Ranjit Malla of Kathmandu, Patan, and Bhaktapur respectively. Prithvi Narayan Shah (c. 1779–1875), with whom we move into the modern period of Nepal's history, was the ninth generation descendant of Dravya Shah (1559–1570), the founder of the ruling house of Gorkha. Prithvi Narayan Shah succeeded his father Nara Bhupal Shah to the throne of Gorkha in 1743 CE. King Prithvi Narayan Shah was quite aware of the political situation of the Valley kingdoms as well as of the Baise and Chaubise principalities. He foresaw the need for capturing the small principalities as an urgent condition for survival in the future and set himself to the task accordingly. His assessment of the situation among the hill principalities was correct, and the principalities were subjugated fairly easily. King Prithvi Narayan Shah's victory march began with the conquest of Nuwakot, which lies between Kathmandu and Gorkha, in 1744. After Nuwakot, he occupied strategic points in the hills surrounding the Kathmandu Valley. The Valley's communications with the outside world were thus cut off. The occupation of the Kuti Pass in about 1756 stopped the Valley's trade with Tibet. Finally, Prithvi Narayan Shah entered the Valley. After the victory of Kirtipur. King Jaya Prakash Malla of Kathmandu sought help from the British and so the than East India Company sent a contingent of soldiers under Captain Kinloch in 1767. 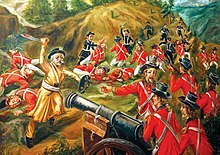 The British force was defeated at Sindhuli by King Prithvi Narayan Shah's army. This defeat of the British completely shattered the hopes of King Jaya Prakash Malla. The capture of Kathmandu (September 25, 1768) was very dramatic. As the people of Kathmandu were celebrating the festival of Indrajatra, Prithvi Narayan Shah and his men marched into the city. A throne was put on the palace courtyard for the king of Kathmandu. Prithvi Narayan Shah sat on the throne. Jaya Prakash Malla somehow managed to escape with his life and took asylum in Patan. When Patan was too captured a few weeks later, both Jaya Prakash Malla and the king of Patan;Tej Narsingh Malla took refuge in Bhaktapur, which was also captured after some time.Thus, the Kathmandu Valley was conquered by King Prithvi Narayan Shah and Kathmandu became the capital of the modern Nepal by 1769. King Prithvi started unifying parts of Baise-Rajya in the Rapti region in around 1760CE. By 1763, Tulsipur-Dang Rajya fell and by 1775 CE, Chauhan Raja Nawal Singh of House of Tulsipur was completely defeated. After losing his northern hill territories to King Prithvi, Chauhan Raja Nawal Singh was forced to move to his southern territories (currently Tulsipur/Balarampur in modern-day India) and ruled as one of the largest Taluqdar of Oudh. King Prithvi Narayan Shah was successful in bringing together diverse religio-ethnic groups under one nation. He was a true nationalist in his outlook and was in favor of adopting a closed-door policy with regard to the British. Not only his social and economic views guided the country's socio-economic course for a long time, his use of the imagery, 'a yam between two boulders' in Nepal's geopolitical context, formed the principal guideline of the country's foreign policy for future centuries. But in the modern days, this saying is to be modified as a 'link between two giant countries' and Nepal can be able to get benefit from both countries. After decades of rivalry between the medieval kingdoms, modern Nepal was unified in the latter half of the 18th century, when Prithvi Narayan Shah, the ruler of the small principality of Gorkha, formed a unified country from a number of independent hill high states. Prithvi Narayan Shah dedicated himself at an early age to the conquest of the Kathmandu Valley and the creation of a single state, which he achieved in 1768. The country was frequently called the Gorkha Kingdom. It is a misconception that the Gorkhali took their name from the Gorkha region of Nepal; actually, the region was given its name after the Gorkhali had established their control of these areas. After Shah's death, the Shah dynasty began to expand their kingdom into much of the Indian subcontinent. Between 1788 and 1791, during the Sino-Nepalese War, Nepal invaded Tibet and robbed Tashilhunpo Monastery in Shigatse. Alarmed, the Qianlong Emperor of the Chinese Qing Dynasty appointed Fuk'anggan commander-in-chief of the Tibetan campaign; Fuk'anggan signed treaty to protect his troops thus attaining a draw. The draw was later converted to victory by Nepali forces sent on commands of PM Jung Bahadur Rana. The revolution of 1951 started when dissatisfaction against the family rule of the Ranas had started emerging from among the few educated people, who had studied in various South Asian schools and colleges, and also from within the Ranas, many of whom were marginalized within the ruling Rana hierarchy. Many of these Nepalese in exile had actively taken part in the Indian Independence struggle and wanted to liberate Nepal as well from the autocratic Rana occupation. The political parties such as The Prajaparishad and Nepali Congress were already formed in exile by leaders such as B. P. Koirala, Ganesh Man Singh, Subarna Sumsher Rana, Krishna Prasad Bhattarai, Girija Prasad Koirala, and many other patriotic-minded Nepalis who urged the military and popular political movement in Nepal to overthrow the autocratic Rana Regime. Thus Nepali congress formed a military wing Nepali Congress's Liberation Army Among the prominent martyrs to die for the cause, executed at the hands of the Ranas, were Dharma Bhakta Mathema, Shukraraj Shastri, Gangalal Shrestha, and Dasharath Chand who were the members of Praja Parisad. This turmoil culminated in King Tribhuvan, a direct descendant of Prithvi Narayan Shah, fleeing from his "palace prison" in 1950, to India, touching off an armed revolt against the Rana administration. This eventually ended in the return of the Shah family to power and the appointment of a non-Rana as prime minister according to a tri-partite agreement signed called 'Delhi Compromise'. A period of quasi-constitutional rule followed, during which the monarch, assisted by the leaders of fledgling political parties, governed the country. During the 1950s, efforts were made to frame a constitution for Nepal that would establish a representative form of government, based on a British model.there was a 10-member cabinent under Prime Minister Mohan Shumsher having 5 members of Rana and 5 of Nepali congress party. This government drafted a constitution called 'Interim Government Act' which was the first constitution of Nepal. But this Government doomed as Ranas and Congressmen were never on good terms. So, on 1 Mangsir 2008 BS, the king formed a new government of 14 ministers. which was also dissolved. later on Sharawan 2009 BS King formed 5 members councillors government which was also failed. Declaring parliamentary democracy a failure, King Mahendra carried out a royal coup 18 months later, in 1960. He dismissed the elected Koirala government, declared that a "partyless" system would govern Nepal, and promulgated another new constitution on December 16, 1960. Subsequently, the elected Prime Minister, Members of Parliament and hundreds of democratic activists were arrested. (In fact, this trend of arrest of political activists and democratic supporters continued for the entire 30-year period of partyless Panchayati System under King Mahendra and then his son, King Birendra). The new constitution established a "partyless" system of panchayats (councils) which King Mahendra considered to be a democratic form of government, closer to Nepalese traditions. As a pyramidal structure, progressing from village assemblies to the Panchayat system constitutionalized the absolute power of the monarchy and kept the King as head of state with sole authority over all governmental institutions, including the Cabinet (Council of Ministers) and the Parliament. One-state-one-language became the national policy in an effort to carry out state unification, uniting various ethnic and regional groups into a singular Nepali nationalist bond. The 'Gaun Pharka Aviyan' launched in 1967, was one of the main rural development programs of the Panchayat system. King Mahendra was succeeded by his 27-year-old son, King Birendra, in 1972. Amid student demonstrations and anti-regime activities in 1979, King Birendra called for a national referendum to decide on the nature of Nepal's government: either the continuation of the panchayat system along with democratic reforms or the establishment of a multiparty system. The referendum was held in May 1980, and the panchayat system won a narrow victory. The king carried out the promised reforms, including selection of the prime minister by the Rastriya Panchayat. People in rural areas had expected that their interests would be better represented after the adoption of parliamentary democracy in 1990. The Nepali Congress with the support of "Alliance of leftist parties" decided to launch a decisive agitational movement, Jana Andolan, which forced the monarchy to accept constitutional reforms and to establish a multiparty parliament. In May 1991, Nepal held its first parliamentary elections in nearly 50 years. The Nepali Congress won 110 of the 205 seats and formed the first elected government in 32 years. In 1992, in a situation of economic crisis and chaos, with spiraling prices as a result of the implementation of changes in policy of the new Congress government, the radical left stepped up their political agitation. A Joint People's Agitation Committee was set up by the various groups. A general strike was called for April 6. Violent incidents began to occur on the evening before the strike. The Joint People's Agitation Committee had called for a 30-minute 'lights out' in the capital, and violence erupted outside Bir Hospital when activists tried to enforce the 'lights out'. At dawn on April 6, clashes between strike activists and police, outside a police station in Pulchok (Patan), left two activists dead. Later in the day, a mass rally of the Agitation Committee at Tundikhel in the capital Kathmandu was attacked by police forces. As a result, riots broke out and the Nepal Telecommunications building was set on fire; police opened fire at the crowd, killing several persons. The Human Rights Organisation of Nepal estimated that 14 persons, including several onlookers, had been killed in police firing. When promised land reforms failed to appear, people in some districts started to organize to enact their own land reform and to gain some power over their lives in the face of usurious landlords. However, this movement was repressed by the Nepali government, in "Operation Romeo" and "Operation Kilo Sera II", which took the lives of many of the leading activists of the struggle. As a result, many witnesses to this repression became radicalized. In March 1997, the Communist Party of Nepal (Maoist) started a bid to replace the parliamentary monarchy with a people's new democratic republic, through a Maoist revolutionary strategy known as the people's war, which led to the Nepalese Civil War. Led by Dr. Baburam Bhattarai and Pushpa Kamal Dahal (also known as "Prachanda"), the insurgency began in five districts in Nepal: Rolpa, Rukum, Jajarkot, Gorkha, and Sindhuli. The Communist Party of Nepal (Maoist) established a provisional "people's government" at the district level in several locations. On June 1, 2001, Prince Dipendra, went on a shooting-spree, assassinating 9 members of the royal family, including King Birendra and Queen Aishwarya, before shooting himself. Due to his survival, he temporarily became king before dying of his wounds, after which Prince Gyanendra (HMG King Birendra's brother) inherited the throne, as per tradition. Meanwhile, the rebellion escalated, and in October 2002 the king temporarily deposed the government and took complete control of it. A week later he reappointed another government, but the country was still very unstable. In the face of unstable governments and a siege on the Kathmandu Valley in August 2004, popular support for the monarchy began to wane. On February 1, 2005, Gyanendra dismissed the entire government and assumed full executive powers, declaring a "state of emergency" to quash the revolution. Politicians were placed under house arrest, phone and internet lines were cut, and freedom of the press was severely curtailed. The king's new regime made little progress in his stated aim to suppress the insurgents. Municipal elections in February 2006 were described by the European Union as "a backward step for democracy", as the major parties boycotted the election and some candidates were forced to run for office by the army. In April 2006 strikes and street protests in Kathmandu forced the king to reinstate the parliament. A seven-party coalition resumed control of the government and stripped the king of most of his powers. As of 15 January 2007, Nepal was governed by a unicameral legislature under an interim constitution. On December 24, 2007, seven parties, including the former Maoist rebels and the ruling party, agreed to abolish the monarchy and declare Nepal the Federal Republic. In the elections held on 10 April 2008, the Maoists secured a simple majority, with the prospect of forming a government to rule the proposed 'Republic of Nepal'. On May 28, 2008, the newly-elected Constituent Assembly declared Nepal the Federal Democratic Republic, abolishing the 240-year-old monarchy. The motion for the abolition of the monarchy was carried by a huge majority: out of 564 members present in the assembly, 560 voted for the motion while 4 members voted against it. On June 11, 2008, ex-King Gyanendra left the palace. Ram Baran Yadav of the Nepali Congress became the first President of the Federal Democratic Republic of Nepal on July 23, 2008. Similarly, the Constituent Assembly elected Pushpa Kamal Dahal (popularly known as Prachanda) of the Unified Communist Party of Nepal (Maoist) as the first Republican Prime Minister on August 15, 2008, favoring him over Sher Bahadur Deuba of the Nepali Congress Party. After failing to draft a constitution before the deadline, the existing Constituent Assembly was dissolved[by whom?] (28 May 2012) and a new interim government (2013-2014) formed under the Prime-Ministership of the Chief Justice of Nepal, Supreme Court judge Khil Raj Regmi. In the Constituent Assembly election of November 2013 the Nepali Congress won the largest share of the votes but failed to get a majority. The Communist Party of Nepal (Unified Marxist–Leninist) (CPN (UML)) and the Nepali Congress negotiated to form a consensus government, and Sushil Koirala of the Nepali Congress was elected as Prime Minister (February 2014) with support from the CPN (UML). Minority ethnic groups like Madhesi and Tharu have protested vigorously against the constitution which came into effect on September 20, 2015. They point out that their concerns have not been addressed and there are few explicit protections for their ethnic groups in the document. At least 56 civilians and 11 police died in clashes over the draft constitution. In response to the Madhesi protests, India suspended vital supplies to landlocked Nepal, citing insecurity and violence in border areas. It has been alleged[by whom?] that India's denial of petroleum and medicine to Nepal constituted a violation of human rights. Then Prime Minister of Nepal, Oli, publicly accused India for the Blockade calling the act more inhuman than war. India has denied enacting the blockade. ^ a b c Bhattarai, Krishna P. (2008). Nepal. New York: Chelsea House. p. 12. ISBN 9781438105239. ^ Shaha, Rishikesk (1992). Ancient and medieval nepal. Kathmandu: Ratna Pustak Bhandar. pp. 6–7. ISBN 9788185425696. ^ Shrestha, Nanda R. (2002). Nepal and Bangladesh. Santa Barbara, Calif.: ABC-CLIO. p. 22. ISBN 9781576072851. ^ "The Prehistory of Nepal" (PDF). ^ Krishna P. Bhattarai (2009). Nepal. Infobase publishing. ISBN 9781438105239. ^ Social Inclusion of Ethnic Communities in Contemporary Nepal. KW Publishers Pvt Ltd. 15 August 2013. pp. 199–. ISBN 978-93-85714-70-2. ^ Sarkar, Jayanta; Ghosh, G. C. (2003). Populations of the SAARC Countries: Bio-cultural Perspectives. Sterling Publishers Pvt. Ltd. ISBN 9788120725621. ^ "Kirates in Ancient India by G.P. Singh/ G.P. Singh: South Asia Books 9788121202817 Hardcover - Revaluation Books". abebooks.com. Retrieved 2017-12-09. ^ Shaha, Rishikesh. Ancient and Medieval Nepal (1992), p. 7. Manohar Publications, New Delhi. ISBN 81-85425-69-8. ^ Hodgson, B. H. (Brian Houghton) (1880). Miscellaneous essays relating to Indian subjects. Robarts - University of Toronto. London, Trübner. ^ Chaudhary, Radhakrishna. Mithilak Itihas. ISBN 9789380538280. ^ Matteo Miele (2017). "British Diplomatic Views on Nepal and the Final Stage of the Ch'ing Empire (1910–1911)" (PDF). Prague Papers on the History of International Relations: 90–101. Retrieved 2017-10-10. ^ Tucci, Giuseppe. (1952). Journey to Mustang, 1952. Trans. by Diana Fussell. 1st Italian edition, 1953; 1st English edition, 1977. 2nd edition revised, 2003, p. 22. Bibliotheca Himalayica. ISBN 99933-0-378-X (South Asia); 974-524-024-9 (Outside of South Asia). ^ The organisers of the Committee were the Samyukta Janamorcha Nepal, the Communist Party of Nepal (Unity Centre), Communist Party of Nepal (Masal), the Nepal Communist League and the Communist Party of Nepal (Marxist-Leninist-Maoist). ^ When a king's looking-glass world is paid for in blood. Guardian. 2 February 2006. Retrieved on 2012-04-08. ^ Nepalnews.com, news from Nepal as it happens Archived 2016-01-17 at the Wayback Machine. Nepalnews.com. 28 May 2008. Retrieved on 2012-04-08. ^ Why is Nepal's new constitution controversial? ^ "Nepal Will Amend Constitution to End Border Blockade". Time. Retrieved 2018-01-23. Michaels, Axel, et al. "Nepalese History in a European Experience: A Case Study in Transcultural Historiography." History and Theory 55.2 (2016): 210-232. Garzilli, Enrica, "A Sanskrit Letter Written by Sylvain Lévi in 1923 to Hemarāja Śarmā Along With Some Hitherto Unknown Biographical Notes (Cultural Nationalism and Internationalism in the First Half of the 21st Cent. : Famous Indologists Write to the Raj Guru of Nepal – no. 1), in Commemorative Volume for 30 Years of the Nepal-German Manuscript Preservation Project. Journal of the Nepal Research Centre, XII (2001), Kathmandu, ed. by A. Wezler in collaboration with H. Haffner, A. Michaels, B. Kölver, M. R. Pant and D. Jackson, pp. 115–149. Garzilli, Enrica, "Strage a palazzo, movimento dei Maoisti e crisi di governabilità in Nepal", in Asia Major 2002, pp. 143–160. Garzilli, Enrica, "Il nuovo Stato del Nepal: il difficile cammino dalla monarchia assoluta alla democrazia", in Asia Major 2005-2006, pp. 229–251. Garzilli, Enrica, "Il Nepal da monarchia a stato federale", in Asia Major 2008, pp. 163–181. Garzilli, Enrica, "Le elezioni dell'Assemblea Costituente e i primi mesi di governo della Repubblica Democratica Federale del Nepal", in Asia Maior 2010, pp. 115–126. Garzilli, Enrica, "Nepal, la difficile costruzione della nazione: un paese senza Costituzione e un parlamento senza primo ministro", in Asia Maior 2011, pp. 161–171. Garzilli, Enrica, "The Interplay between Gender, Religion and Politics, and the New Violence against Women in Nepal", in J. Dragsbæk Schmidt and T. Roedel Berg (eds. ), Gender, Social Change and the Media: Perspective from Nepal, University of Aalborg and Rawat Publications, Aalborg-Jaipur: 2012, pp. 27–91. Garzilli, Enrica, "Nepal, stallo politico e lentezze nella realizzazione del processo di pace e di riconciliazione", in Asia Maior 2012, pp. 213–222. Garzilli, Enrica, "A Sanskrit Letter Written by Sylvain Lévy in 1925 to Hemarāja Śarmā along with Some Hitherto Unknown Biographical Notes (Cultural Nationalism and Internationalism in the First Half of the 20th Century – Famous Indologists write to the Raj Guru of Nepal – No. 2)", in History of Indological Studies. Papers of the 12th World Sanskrit Conference Vol. 11.2, ed. by K. Karttunen, P. Koskikallio and A. Parpola, Motilal Banarsidass and University of Helsinki, Delhi 2015, pp. 17–53. Garzilli, Enrica, "Nepal 2013-2014: Breaking the Political Impasse", in Asia Maior 2014, pp. 87–98. The Kingdom of Nepal, also known as the Kingdom of Gorkha or Asal Hindus, was a Hindu kingdom on the Indian subcontinent, formed in 1768, by the unification of Nepal. Founded by King Prithvi Narayan Shah, a Gorkhali monarch of Rajput origin from medieval India, it existed for 240 years until the abolition of the Nepalese monarchy in 2008. During this period, Nepal was formally under the rule of the Shah dynasty, which exercised varying degrees of power during the kingdom's existence. Maharajadhiraja Prithivi Narayan Shah was the last ruler of the Gorkha Kingdom in the, present-day Nepal, and first monarch of Kingdom of Nepal. He claimed to be a Gorkhali. Majority of the people credit Prithvi Narayan Shah for starting the campaign for the unification of Nepal, while some feel contempt against him for colonization. The Rai people are indigenous ethnolinguistic groups of the Indian subcontinent, what is now modern-day Nepal and present-day India, mainly in the Indian states of Sikkim and West Bengal. They were Rai meaning king (Rai means King in old Khas Kura. When the king Prithvi Narayan Shah couldn't defeat Khambu king, he somehow took them in confidence that the land is theirs forever and gave them the title Rai in around B.S. 1832. Then the post-Rai was provided to the topmost leaders of the region. They were given the power to collect land tax. That's why sometimes Rai people are called Jimee or Jimee-wal. The Rai belong to the Kirati group or the Kirat confederate Limbu, Sunuwar, Yakkha and Dhimal ethnic groups. Before the Shah dynasty begun their territorial expansion, Nepal was known as Nepal Mandala. After conquering Nepal in the mid-eighteenth century, King Prithvi Narayan Shah moved his ruling state to Nepal from Gorkha. Jaya Prakash Malla was the last king of Yen (यें) or Kantipur (कान्तिपुर) which corresponds to present-day Kathmandu. He ruled from 1736 to 1746, and then from 1750 until his death in 1768. Nuwakot (नुवाकोट)is a town in Nuwakot district of central reagen Nepal, located above the Trishuli and Tandi Rivers. It Located just 75 km west of Kathmandu, known as historic town which was the capital of the Valley in the days before the unification of Nepal by Prithvi Narayan Shah, and for more than 1,000 years the hilltop had served as a lookout and fort (kot) guarding the western entrance to Kathmandu Valley. Nuwakot served as an important trading hub for the Malla kings of the Valley, and was along a major transit route used for trade between India and Tibet. Making the Nuwakot hill as main forts including other eight forts: Malakot, Simalkot, Bhairabkot, Belkot, Kalikot, Salyankot, Dhuwankot and Pyaskot in its sorrounding area, collectively named as 'Nawakotta'(Nine forts). Basnyat family or Basnet dynasty was a Kshatriya (Rajput-Chhetri) family involved in the politics and administration of the Gorkha Kingdom and Kingdom of Nepal. This family got entry into Thar Ghar aristocracy group of Gorkha at the time of King Prithvi Narayan Shah. It was one of the four noble family to be involved in active politics of Nepal together with Shah dynasty, Pande family and Thapa dynasty before the rise of Rana dynasty. This family is descended from Shivaram Singh Basnyat, the commander of Gorkhali forces and a member of Shreepali Basnyat clan of Gorkha. This family was maritally linked to Kala (Black) Pande section of Pande family through Chitravati Pande who married Kaji Kehar Singh Basnyat. This family was the last Kshatriya (Chhetri) political family to be wiped out from the central power by Jung Bahadur Rana during the Bhandarkhal Massacre in 1846. The history of the city of Kathmandu, which is inseparable from that of the Kathmandu valley, dates back to ancient times. The Sino-Nepalese War, also known as the Sino-Gorkha war and in Chinese the Campaign of Gorkha, was an invasion of Tibet by Nepal from 1788-1792. The war was initially fought between Nepalese and Tibetan armies over a trade dispute related to a long-standing problem of low-quality coins manufactured by Nepal for Tibet. 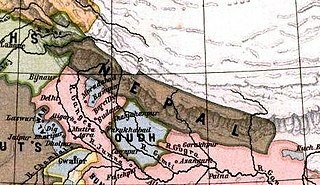 The Nepalese Army under Bahadur Shah plundered Tibet under Qing rule and Tibetans signed the Treaty of Kerung paying annual tribute to Nepal. However, Tibetans requested for Chinese intervention and Sino-Tibetan forces under Fuk'anggan raided Nepal up to Nuwakot only to face strong Nepalese counterattack. Thus, both countries signed the Treaty of Betrawati. The Battle of Kathmandu occurred during the Gorkhali conquest of Nepal. It was fought in Kathmandu in 1768, and resulted in the defeat of its king Jaya Prakash Malla by Prithvi Narayan Shah, king of the adjoining Gorkha Kingdom. The Battle of Bhaktapur was the final campaign in the Gorkha conquest of Nepal. It took place in Bhaktapur in 1769, and resulted in the victory of the Gorkhali king Prithvi Narayan Shah, giving him control of the entire Kathmandu Valley and adjoining areas. Ram Krishna Kunwar or Ramakrishna Kunwar was military commander (Sardar) of Gorkha Kingdom during the Unification of Nepal at the reign of King Prithvi Narayan Shah. He was born circa 1728 AD to Ashiram Kunwar in the Kunwar family. His descendents went on to found the Rana dynasty of Nepal. He was successful general in the Unification campaign of Nepal of King Prithvi Narayan Shah. He defeated British forces at Hariharpur Gadhi on 25 August 1767. He died in Mechi Campaign in 1771 A.D.